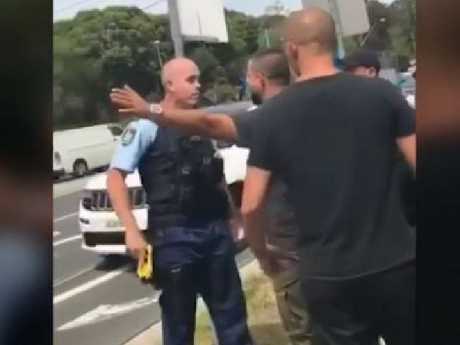 A DRAMATIC clash between a police officer and mourners heading to the funeral of slain bikie boss Mahmoud "Mick" Hawi has been caught on camera. 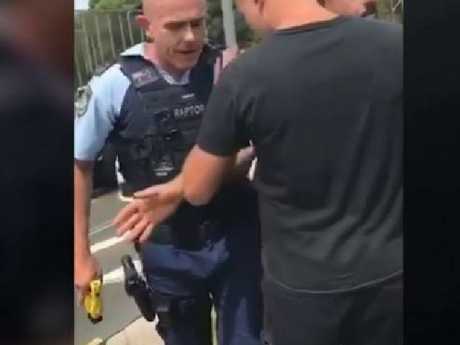 The NSW Police officer draws a Taser as he gets into a verbal stoush with one of Hawi's friends. 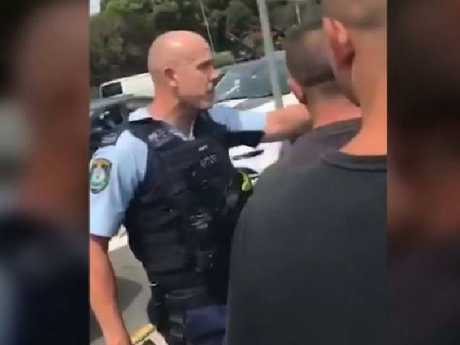 "Brother, there's 30 of us and there's two of you, show some respect," the man tells the officer, getting right in his face. Pushing the man away, the officer responds: "I don't care, you're going to be searched, stand against the fence all of you. You're all being searched for firearms and drugs." The police officer, identified by the Daily Mail as Senior Constable Andrew Murphy, is reported known by his self-appointed nickname of "Raptor 13". Constable Murphy is a member of Strike Force Raptor, an elite police unit made up of 55 heavily armed police officers tasked with dismantling violent bikie gang, according to the Mail. 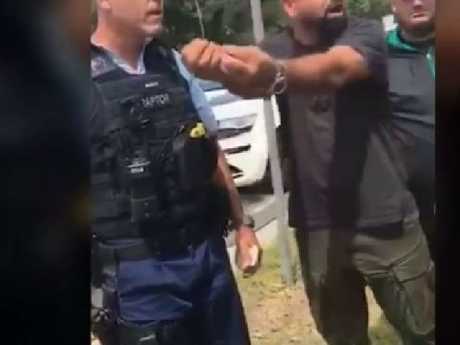 In the footage, Constable Murphy is seen drawing his taser and shouting: "You're going to get searched" to the group as they gather around him. 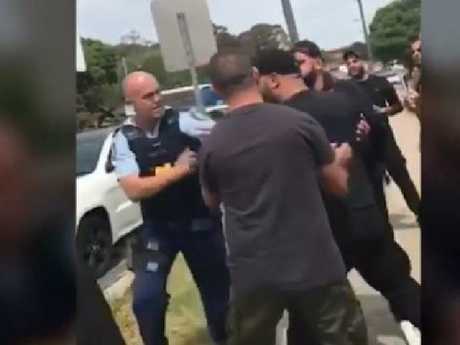 The confrontation took place after the officer pulled over a large group of men at King Georges Road near Wiley Park as they made their way to Hawi's funeral service in Sydney's south. 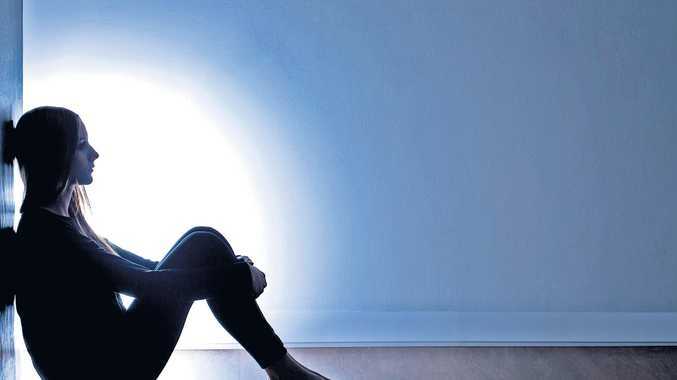 Police are still searching for at least two gunmen seen fleeing from the scene of Hawi's murder on Thursday last week. The 37-year-old father and former Comanchero national president was shot multiple times as he sat in his luxury car outside the Fitness First gym in Rockdale. Hundreds of people turned up to yesterday's funeral service at the Fatima Al-Zahra Masjid mosque in Arncliffe. The event was monitored under a heavy police presence, with detectives taking a photograph of every man, woman and child who attended. Mourners almost exclusively wore black, many sporting T-shirts and hoodies emblazoned with Hawi's image. Close friends and family arrived in a fleet of luxury cars, including three white stretch Bentleys, a white Porsche and a white Rolls Royce. As they prayed inside the mosque, police were outside handing out parking tickets. After the service, Hawi's casket was escorted by a procession of flashy vehicles to Rookwood Cemetery, where he was buried in the Islamic section. 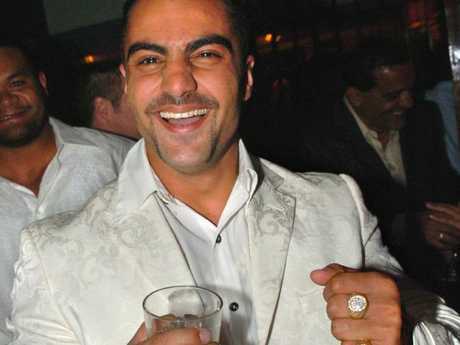 Hawi served several years in jail for manslaughter over the bashing death of Hells Angels associate Anthony Zervas in a wild brawl at Sydney Airport in 2009.